Hello! 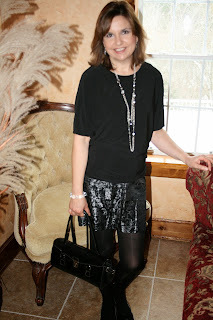 Just a quick Fashion Over Fifty post to show you what I wore for the Christmas Service at our church. I had to sing for the service, so I wanted something a bit more dressy. At first, I was just going to wear the standard red blouse/black pants ensemble, but it seemed to casual for a Christmas Service, so I pulled out this very old, never worn before brocade skirt. My daughter actually picked this skirt up at a thrift store but it's a very tiny size two and she couldn't squeeze into it. We are about the same weight, but were proportioned very differently, so she gave it to me to wear. If I put a girdle on and sucked in my gut, I could zip it up; as long as I didn't breathe all day, I was fine. 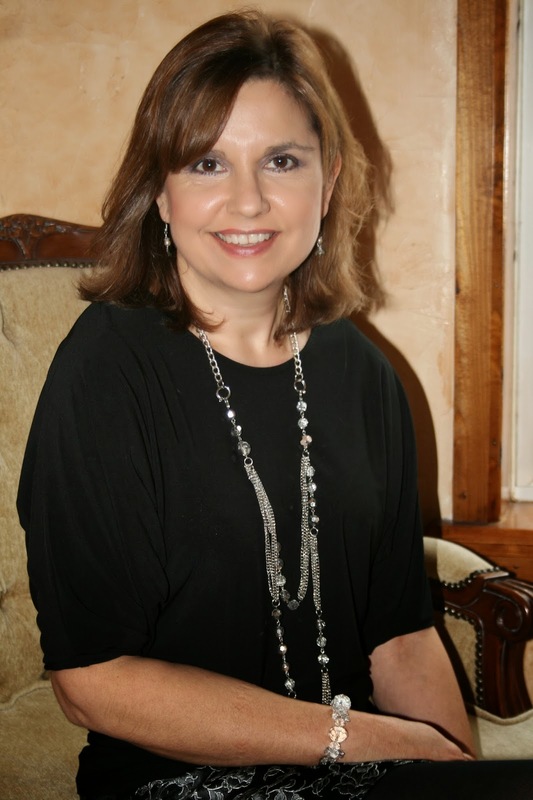 Anyway, besides the discomfort I also never wore the skirt because I felt it was too short….especially for church. But my daughter gave me a helpful hint: if skirts seem to short for my comfort level: wear them with coordinating tights. So I put black tights underneath the skirt, and I felt fine about it. Brocade is all the rage this season, and how wonderful it was that I already had a brocade skirt in my closet that I never wore before! The silver metallic was especially flattering for the holidays. I got so many compliments on this outfit when I wore it, it was ridiculous. And it didn't even cost me anything! 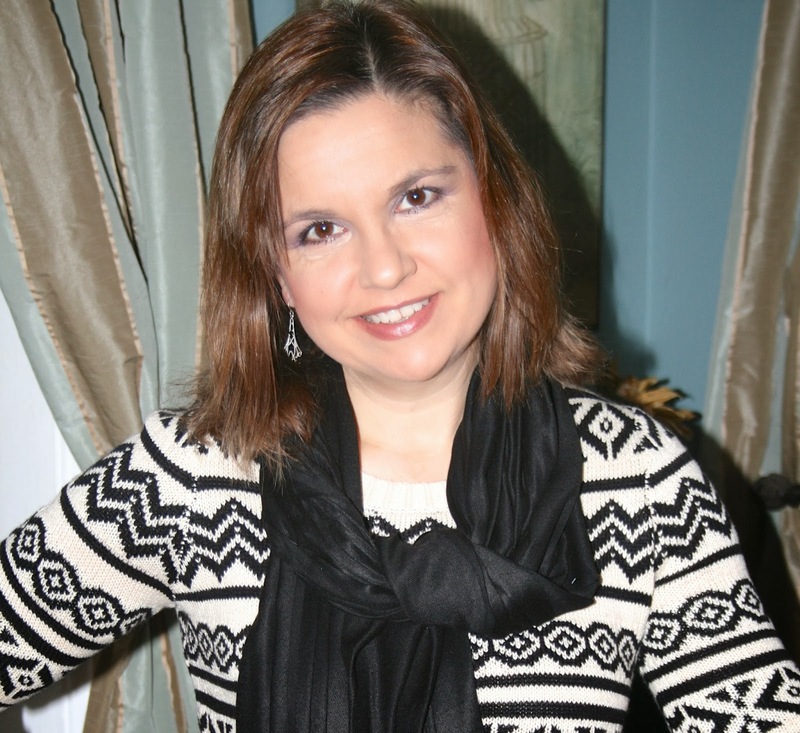 For my top I wore a black knit shirt that I got from Stitchfix. 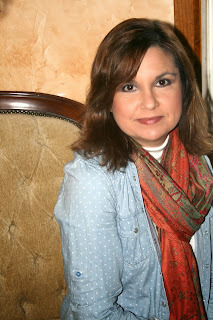 I previously wore this shirt with a mustard skirt HERE. My jewelry was a long silver chain and clear bead necklace, a chunky clear beaded bracelet, and some silver angel earrings that a friend from work gave me for Chrismas. For shoes, I wore simple black flats with a black velvet bow. They didn't photograph well because of the black tights, you might be able to see them better in the mustard skirt post I linked to. Hello! I FINALLY MADE SOMETHING! After weeks of travel and fashion posts, I finally had some time to spend in my craft room and create a card. Now I'm sure no one will be around to view it, because it's the time of year when everyone takes a blogging break. Oh well. My card stash is the lowest it has ever been, so I needed to start making some birthday cards. For this card I used a Heather Ellis Pure Innocence Digital Image (30) and a card sketch from the Deconstructed Sketch (129). The paper is My Minds Eye Stella Rose 'Mabel'. The image was printed twice and the cupcake was cut out and popped up on dimensionals. I put Crystal Effects on the cherry and Stickles on the jimmies. The sentiment is from Hero Arts. Hello and welcome to another Fashion Over Fifty post. I actually have a day off today where I don't have too much to do other than laundry and plant watering, so I'm hoping to get some time to play in my craft room so I have something 'crafty' to show you. I know I haven't posted any of my creations in weeks, and I apologize for that, it's just 'the Christmas Season'…..busy, busy, busy. However, for this week's Fashion Over Fifty post I wanted to show you a geometric outfit I wore recently. 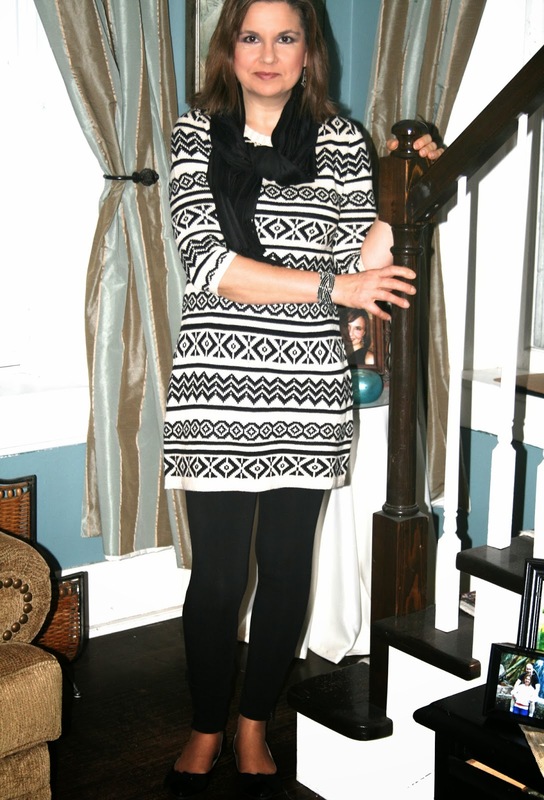 The key to wearing bold, geometric prints for me is to keep the colors neutral. 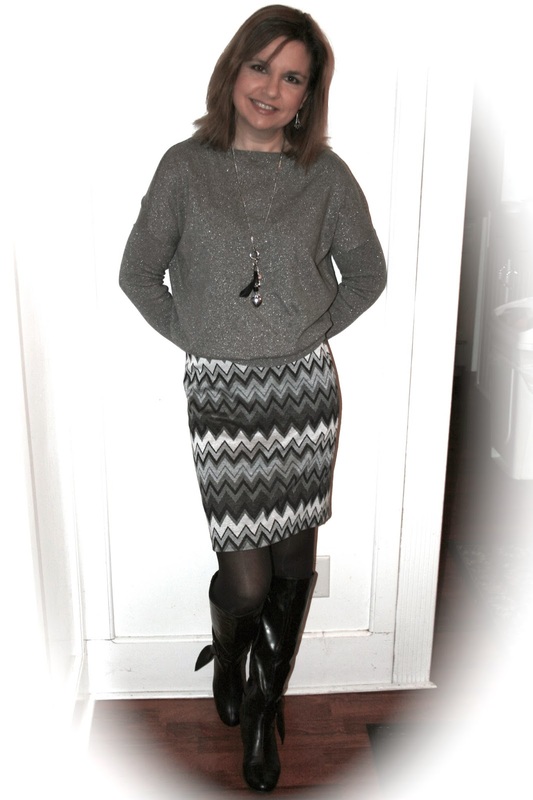 I found this skirt by Worthington at J.C. Penney last year and fell in love with the zig zag print and the comfortable knit material. The sweater is a pretty grey metallic sweater by a.n.a. also sold at J.C. Penny last year. It has a drop seam sleeve that hits right at the arm bicep, and the rest of the sleeve is tighter at the forearm. For jewelry I wore a long silver charm necklace that also had a black feather as one of it's charms, black/silver drop earrings, and a black/silver bracelet. Although we finally got some relief from the freezing temperatures here in northern Wisconsin, it was bitterly cold the day I wore this outfit so I stayed warm with black boots and tights. 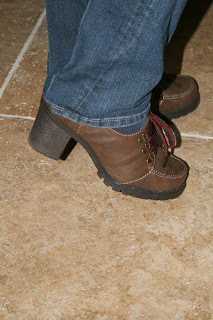 The boots were purchased last year from Famous Footwear. 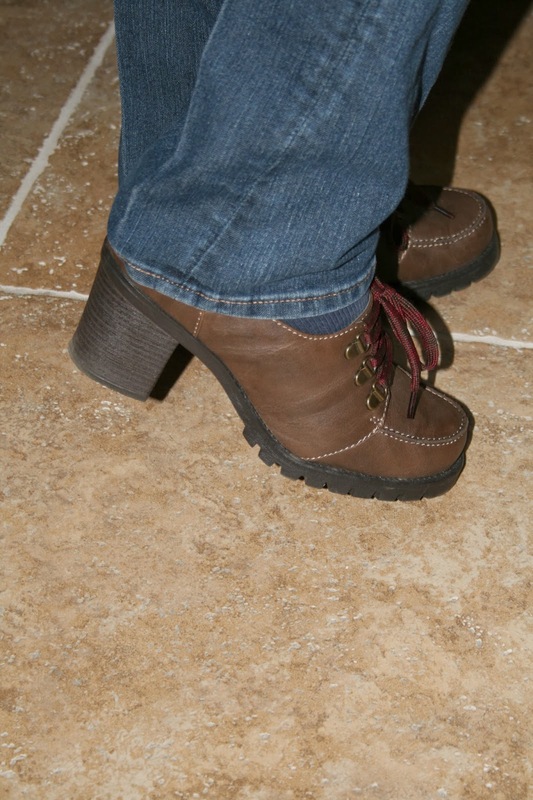 The boots have a very unique detail at the ankle that I really like: a half bow connected to a buckle. Hello! 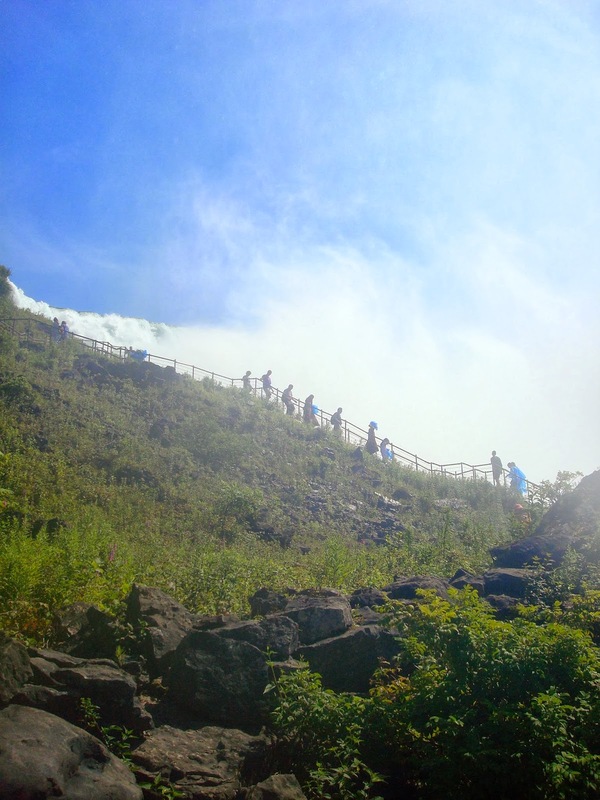 I'm back with my second post of our trip to Niagara Falls, and the very last post of our New Hampshire/Vermont vacation that we took back in August. On my first post of Niagara Falls, I told all about our adventures on the Maid of the Mist. 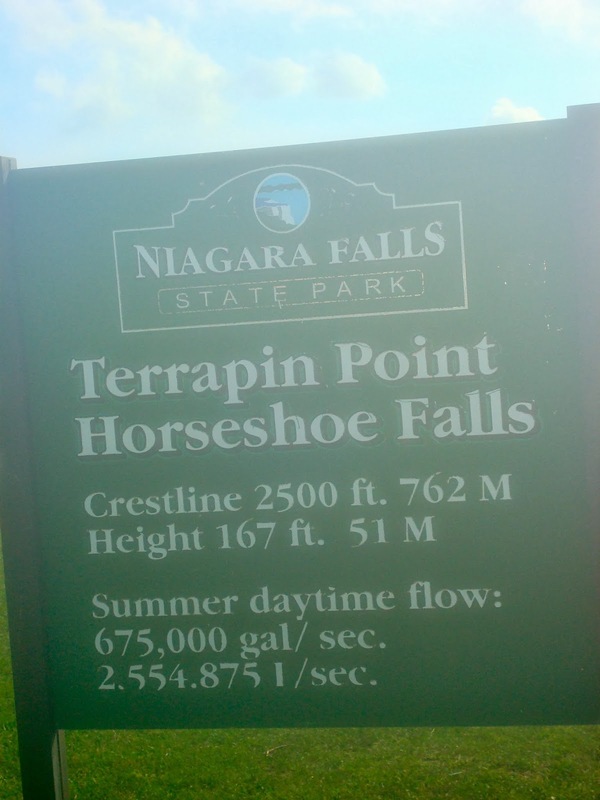 Today's post will focus on our walking tour of the Niagara Falls State Park. After we finished our boat tour of the falls, we saw this trail that takes you right up the side of the falls. The steps are cement and there is a hand rail, which you really need because the steps are very wet and can be slippery. You do get soaking wet on this trail because the mist from the falls hits you very hard. Moss and other vegetation grows very well on the rocks next to the falls due to all the mist. My soaking wet, dripping husband enjoying every minute of this hike up the falls. My and my handsome son standing on the tower ledge. A view of the top of The Crow's Nest, the trail that I described above where you get very wet! One of the things that surprised us about our visit to Niagara Falls was that we didn't realize it was a state park filled with beautiful walking trails and many other activities. For some reason, we just had it in our heads that it was a place that you just walked up to and looked at and left. We were very awestruck with the beauty of the park and how people of all ages, nationalities, and walks of life seemed to enjoy it. And did you know it's free? Yes, it is. It does cost money to park, but you can avoid that cost by parking on the road and walking in. 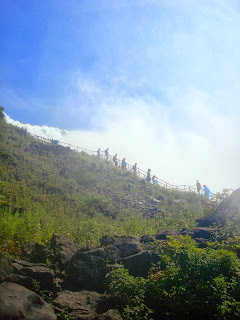 And the Maid of the Mist, the Observation Tower, and other tours charge a very small fee, but to just walk the gorgeous trails and view the Falls is completely, and totally free so everyone can enjoy them. After we descended the tower, we started walking the paths in the park. The first path took us along the raging white waters that flow into the falls. The bridge in the picture below is part of the path that you take across the river to view the other two waterfalls. 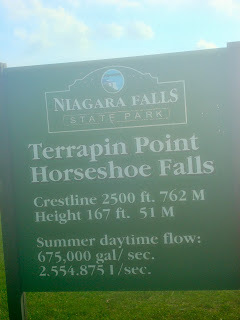 The trail from the tower leads to Terrapin Point Horseshoe Falls. This area was very misty and wet because of the sheer power of the falls. It was so difficult to get a clear photograph, and my camera became very wet and filled with moisture. When exiting the park, we came across this old brick arch. It reminded me of one of the many old stone structures I saw in Italy, so I snapped a picture of it. 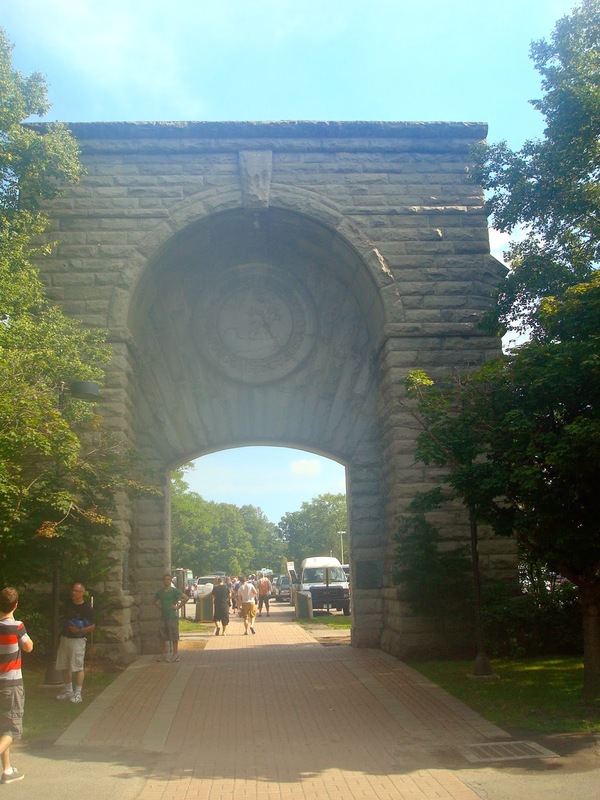 I believe it was probably one of the original entrances to the park, but I'm really not sure and couldn't find any information on it when I googled it, so feel free to correct me if you know the history of these beautiful stones. 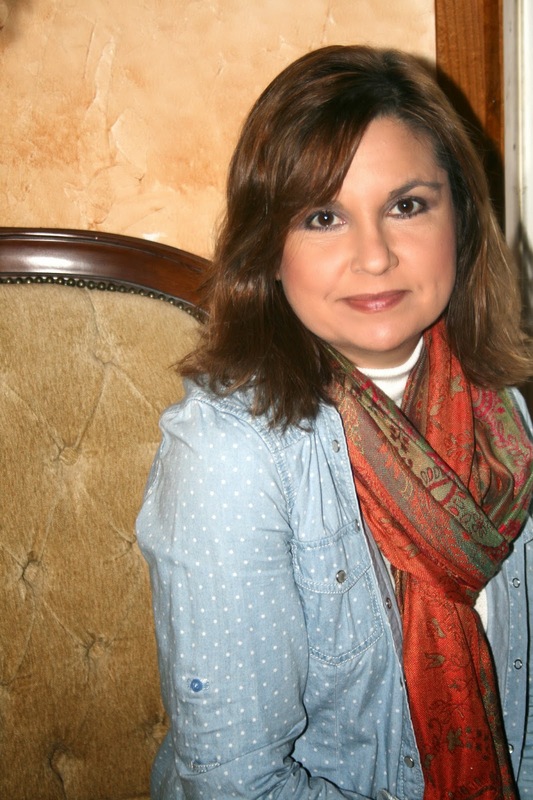 Fashion Over Fifty: Denim on Denim? Hello! 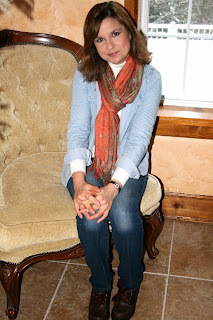 This week's Fashion Over Fifty post is a casual outfit where I'm wearing denim on top and on the bottom. There use to be a old fashion rule where it was stated that one shouldn't wear more than one piece of denim at a time. However, based on all the fashion photos I've been seeing lately, I think that rule has long been broken. 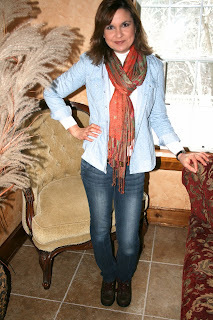 For me the key to wearing multiple layers of denim is to wear different shades of denim. In the photo below I'm wearing a darker denim jean with a lighter denim shirt. I also wore a scarf to break up the sea of blue and add a contrasting color (that and it was below zero outside and I was freezing!). Because the thin chambray shirt would have been too cold in this kind of weather, I added a white turtleneck sweater underneath for extra warmth. My chambray shirt actually has little white polka dots on it, which also helps to break up that all denim look by bringing in a pattern and some whimsy. 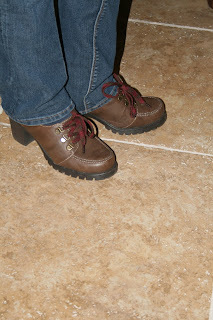 For footwear, I wore these mid heel brown leather shoes from Famous Footwear. I love these shoes because they are a bit dressy and have a little heel, yet, the treads on the bottom are perfect for walking on our icy side walks that we have here in Wisconsin. Hello! 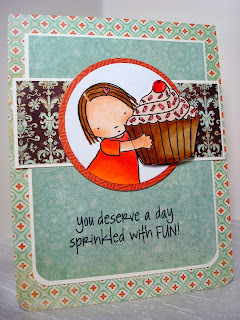 Still no crafty paper crafting creations from me today. Although I FINALLY had two days off and spent them entirely at home, it was catch-up day for me: I did loads and loads of laundry, took down the fall decorations, watered the plants, and addressed all my Christmas Cards. Now that everything is done, maybe on my next day off, I can actually play in my craft room again. 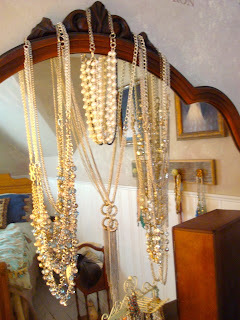 For today's post I wanted to show you some pictures of how I store my ever increasing and massive amounts of jewelry. I love jewelry and even though I have tons of it, I never seem to have just the right piece that's just the right length, color, or style for my outfit, so I end up collecting more and more all the time. It's all cheap, costume jewelry; I don't think I have spent more than $20.00 on any piece, and a lot of it I made myself. Anyway, as my collection of jewelry increased, I started running out of space to store it. 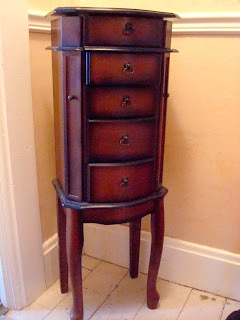 I started with the simple brown upright jewelry box in the photo below. When that filled up, I bought the pretty ivory iron display stand that's next to it. But then I ran into the problem where a lot of jewelry was too long to fit in a jewelry box or on a small stand, so I started hanging it over the mirror in my room. Now your probably wondering, what does my husband think of all this. You know, he actually likes it, and he is a very manly man! He thinks it's very creative and it all adds to the vintage charm of the room. When choosing what to hang where, I picked 'like' items when grouping. This is my collection of silver and pearls necklaces. Well eventually I ran out of room on my mirror and I saw this idea on Pinterest. It's an old weathered board with vintage glass knobs. I showed the picture to my husband and he made me one. It needs about three more knobs though so I will keep on the look out for them when shopping. 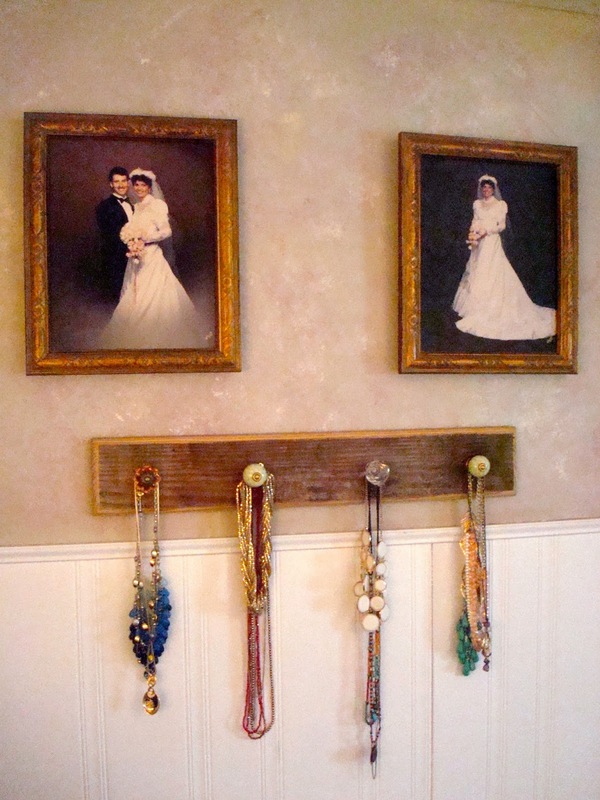 We hung the board under our wedding photos. My husband bought this jewelry stand as a Christmas Gift for me several years ago. It's very large, and I do like it, but again, my really long necklaces don't fit in it, and things tend to get 'lost' in the drawers. So I keep things I don't wear very much in this cabinet. I recently found this vintage frame that has a screen in it for hanging earrings at Hobby Lobby. I absolutely LOVE it! It's perfect for displaying delicate bangle earrings. I probably wear bracelets more than any other type of jewelry so when I saw this jewelry display stand I knew it would be perfect for my collection. It is made primarily for people who sell jewelry to display their creations. I love how the sun comes inside the room in the morning and hits all the gems and shoots a rainbow of light around the room. The black velvet necklace stand is also a display for jewelry sellers, but I use it to display a necklace that constantly gets twisted up if I just leave it hanging from a knob or hook. It takes a long time to untangle it, so I just leave it on the display stand where it never gets tangled. I really love how all my jewelry adds glamour and romance to my bedroom and fits in so well with the vintage decor of my 100+ year old home. And I'm grateful to a husband who's masculinity isn't threatened by all this girly stuff draped all over his bedroom. Hello! I have another travel post for you today because I haven't had any time to be in my craft room to create anything for weeks. In fact, I haven't been home other than to sleep and take a shower for the past two weeks. If I'm not at my full time job, I've been at my church decorating it for Christmas. My own house is just falling apart. The houseplants haven't been watered for two weeks, my dishes and laundry keep piling up, and I still have fall decorations up. It's ridiculous. Today, the fall decorations will come down as I finally have a day off, although I'm really not happy about having to go outside in below zero temps to remove them. They are probably all frozen in the ground by now. It's been ridiculously cold here in Wisconsin. Anyway, enough ranting about my lack of time and back to my travel post. As most of you probably already know, I've been posting pictures and stories of our August Vacation to New Hampshire/Vermont for months now, and I'm happy to tell you that I'm just about at the end of this journey as I wrap up this series with a couple of posts about Niagara Falls. Now, for some reason, although I've heard about Niagara Falls my entire life, I really had no desire to go there. I don't really know why, maybe because it's very 'touristy' and I don't generally like 'touristy' activities. But on our three day journey to the east coast, we had to drive right past Niagara Falls so we thought, 'We might as well as stop and take a look, because this might be the only chance we'll ever get to see it'. And I'm so happy that we did because we had the time of our lives! 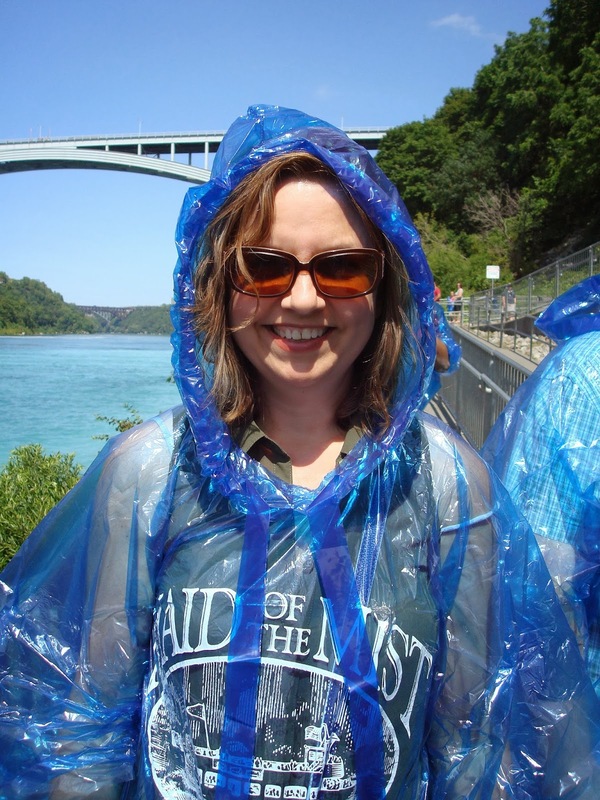 The first thing we did when we got to Niagara Falls was to take the Maid of the Mist boat ride. What a blast that was! The boat takes you on a short tour of all the waterfalls and takes you very, very close to the falls themselves. 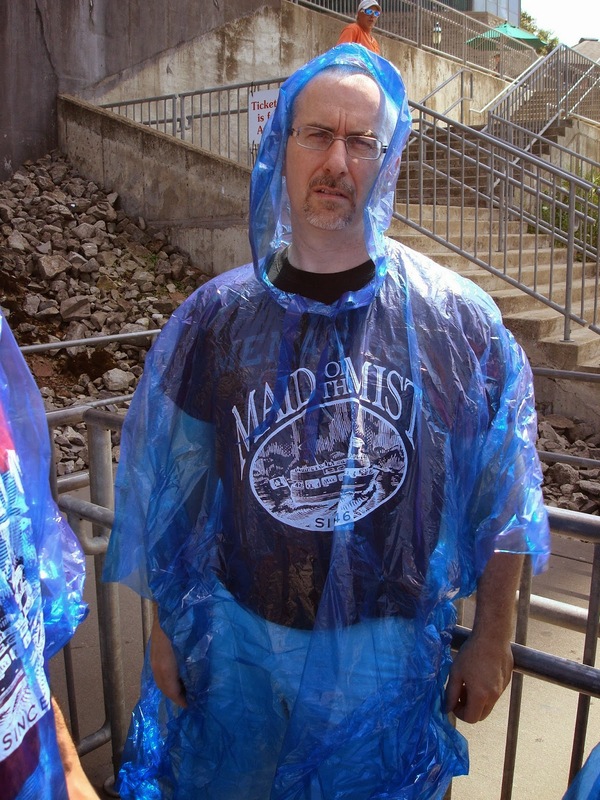 And you get soaking wet….the plastic ponchos are a must! Here is one of the boats as it glides past the first waterfall. This is the boat station where you wait for the boat to arrive. The water is so clear and has such a beautiful color to it. Here I am in my plastic poncho brimming with excitement! My son-in-law Jason felt like a super hero wearing his poncho! 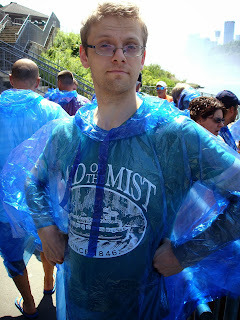 My husband felt so uncomfortable wearing his poncho…the hot sun was beating down on us as we waiting for the boat, and the thin plastic just sticks to your skin. But once we boarded the boat are misery was soon forgotten because you get so close to the falls that the mist of the falls really cools you off quickly. This is a view of one of the boast that shows the Canadian side of the falls. I believe the old building is an old water power facility. This the bridge that connects the American and Canadian borders. The tower to the right is on the American side and has a beautiful view of the falls. I was absolutely amazed at how close the boat was able to get to the falls. You could really feel the power of the falls. It is difficult to see because there is so much water in your eyes. There are actually three waterfalls in Niagara Falls, the Horseshoe Falls, the American Falls, and the Bridal Veil Falls. I believe the one pictured above is the Horseshoe Falls, and the one pictured below is the American Falls. Here is a view of the boats headed to the falls. 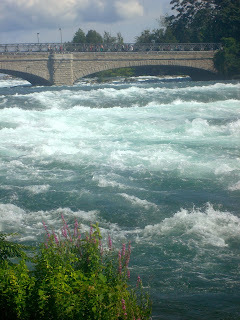 You can see how the two falls form a basin with the American Falls on the left, and the Horseshoe Falls in the center. There was a lot more to see and do in Niagara Falls other than ride the Maid of the Mist, so I will finish up with more pictures and stories in a later post. Hello! 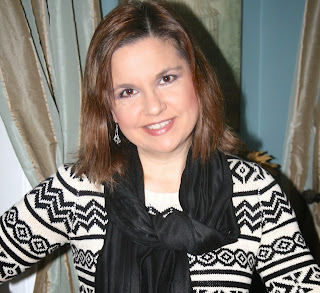 This week's Fashion Over Fifty post is all about the sweater dress. I love sweater dresses! They are so warm and comfy, yet dressy at the same time. 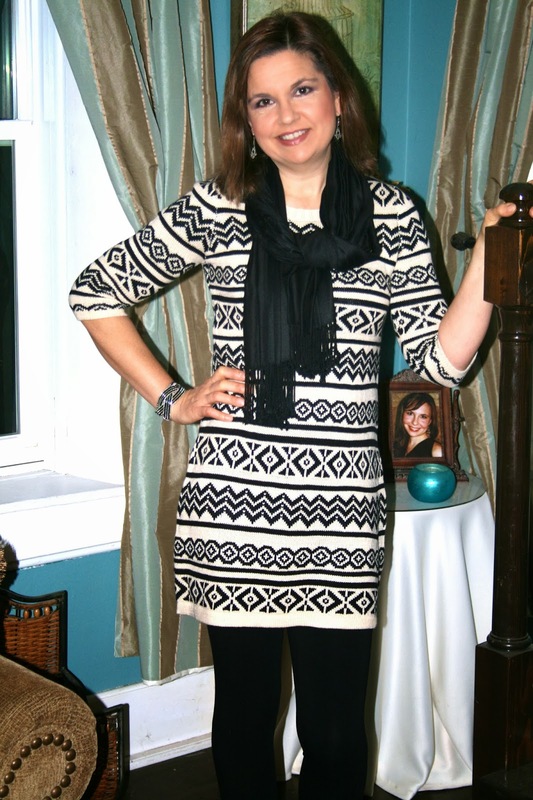 However, I don't really wear my sweater dresses as a dress, but I wear them more like long tunics. I usually wear them with tights, leggings, or skinny jeans for modesty reasons. Now Charming Charlies is normally considered an accessory store, but did you know they also sell clothing? I've only purchased jewelry and scarves from them before, but this visit I only purchased clothes, like this sweater dress . It has a cream base with a black Aztec print. I wore the dress with black leggings from Express that zip at the ankle and a black scarf. I really must get myself to the make up store as soon as I have some free time, because I've noticed in all my photographs that the skin on my face is darker than the skin on my neck. Do you know why? I bought the make up during the summer when my skin was darker. Now that my skin has lightened a bit, my foundation isn't the right color. I'm just so busy with work, I can't get over to the mall. Ugh! Anyway, this close up shows my earrings that I wore with this outfit. It's a silver and black drop earring. 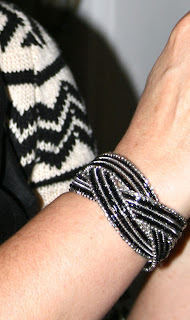 The only other jewelry I wore was this sparkly silver and black bangle from Charming Charlies. My shoes are simple black textured flats with a black bow on top. They are from Express. 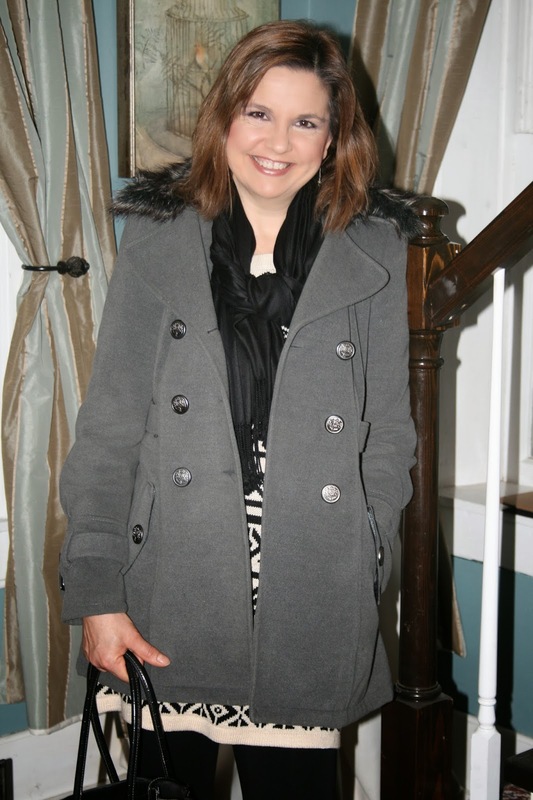 For outwear, I wore this fur trim grey wool coat from J.C.Penney. I hate winter, not only because of the cold, but because of how huge I look due to all the layers of clothing I have to wear to keep warm. Every spring when I shed the layers of clothing I've worn all winter, someone inevitably asks me 'Did you lose weight?' and I always reply 'No, this is just what I look like under four layers of clothes.'. Lol!